According to UNESCO (World Water Report, 2019), 2.1 billion people worldwide have no access to safe drinking water. 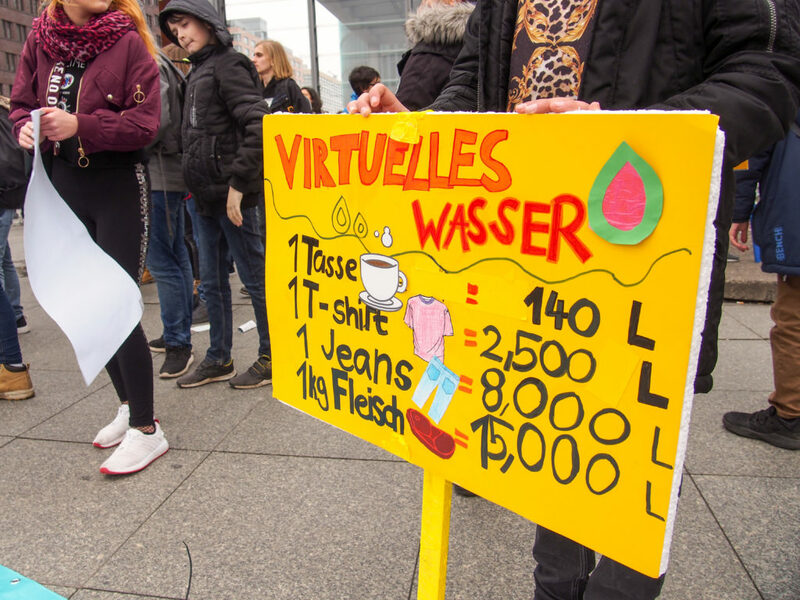 Berlin school children demonstrated against the global water crisis on the occasion of World Water Day 2019. Lugging water-filled jerry-cans and presenting self-made hand washing facilities, the pupils demanded “Water for everyone”. Their message was loud and clear: Everyone has a right to access clean and safe drinking water. Poor and marginalised population groups in particular should not be left out. They are the ones suffering most from the global water crisis: people with disabilities, the elderly, indigenous people, but also girls and women, who in many societies are responsible for providing their families with water and travel great distances every day to do so. At the end of their protest march, the pupils handed over an oversized postcard with their messages to Thilo Panzerbieter, Executive Director of the German Toilet Organization. He presented the students’ demands at a “water stakeholder meeting” in the German Federal Ministry for Economic Cooperation and Development (BMZ) later the same day. The draft federal budget for 2020 is a disappointment when it comes to investments in development cooperation. These budgetary set-backs will make it impossible to meet international commitments and will inhibit the contributions to the implementation of human rights. On their way to Potsdamer Platz, the pupils therefore stopped in front of the Federal Ministry of Finance to demonstrate for more investment into development cooperation. In times of increasing conflict – also over the increasingly scarce resource of water – BMZ is still regarded as one of the largest donors in the field of water. Precisely these funds are therefore essential for reaching marginalised groups in the fight against poverty and to eliminate major inequalities in the access to water. The importance of safe drinking water is illustrated by the following figures: over 50 countries are affected by water stress. Causes include climate change, population growth and the drop in groundwater levels caused by prolonged droughts. The United Nations (UN) estimate that water consumption has increased 6-fold in recent years and that available water resources will become increasingly scarce in the future. This has dramatic consequences: People suffer from hunger, agricultural production becomes increasingly difficult and the fight for water leads to armed conflicts. The World Economic Forum considers the global water crisis to be one of the five greatest risk factors for mankind. The march was initiated by pupils from the Grüner Campus Malchow, the Gemeinschaftsschule on Campus Rütli and the Käthe-Kollwitz-Gymnasium together with GTO. The project is financially supported by the BMZ, by the state office for developmental cooperation of Berlin and by Brot für die Welt. We also thank CWS-boco, who is a long-term supporter of GTO projects. The event is part of GTO’s development education project “Toiletised World” – initiated in 2009. Within the project, GTO organises one-day workshops at schools and jointly plans events to raise public awareness for development-policy issues with the school children.